Six full tuition scholarships at Hastings College of Law for graduates of the American University of Armenia, AUA. To be eligible for the scholarship, students must be California residents who graduate from AUA and meet Hastings’ admission requirements. $500,000 state grant to create study guides for California schools to properly teach the Armenian Genocide. This follows on the heels of last year’s successful effort to budget $10 million for the implementation of the updated Social Science curriculum in California. The Armenian Genocide was one of several subjects included in the updated curriculum. $500,000 ongoing funding source for Glendale Community College to offset cost of closing the campus on April 24th. “As the representative of the largest Armenian American community, I have unique opportunity to learn from my friends and then try to help where I can. This proposal will help students succeed and have the opportunity to obtain their law degrees from a high credited institution. This year, I’m excited by the six scholarships to help talented young people have the opportunity to obtain law degrees from a highly respected law school. I also appreciate that while education is very important for the future, we must also remember our past. I am pleased to be in the position to help educate all of California’s students the historical significance of the Armenian Genocide. 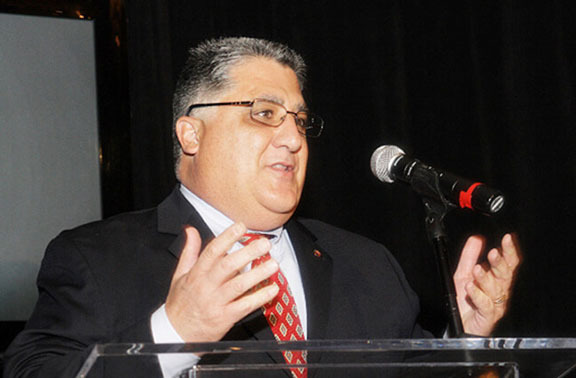 And lastly, I wanted to make sure that GCC isn’t penalized financially for properly commemorating the Armenian Genocide by taking April 24th off,” commented Senator Portantino. “For many years, one of the top priorities of the ANCA-WR has been to formulate a framework and create tools to properly teach Armenian Genocide education in public schools. We are very grateful to Senator Portantino for being so responsive to our concerns and for his ongoing efforts to secure the funding and resources necessary to implement teacher training and publication of educational materials needed to accomplish this goal. We look forward to continued success on this front,” noted Armenian National Committee of America-Western Region Chair, Nora Hovsepian. Portantino proposed the scholarship idea to Armen Der Kiureghian, President of AUA, who immediately offered his support for the proposal. Senator Portantino has a long and distinguished record of supporting the Armenian American Community. In addition to chairing the Education Budget Sub-committee, he also chairs the California Armenia and Artsakh Select Committee. Last year he requested $3 million dollars for the Armenian American Museum in addition to the $10 million dollars for social science curriculum. He has visited Yerevan and Artsakh and supported many local Armenian initiatives and causes. Earlier in the year, he held a historic hearing on the 30th commemoration of the Sumgait Pogrom with a survivor of the atrocity. “Our community has never had a representative who works so hard on our behalf. Senator Portantino supports us and champions our people and our causes. We are very happy and honored to have him representing the largest Armenian American Community in the Country,” concluded Zareh Sinanyan, Mayor of Glendale. Portantino’s Senate proposals will next go to the Conference Committee between the Senate and the Assembly which is tasked to reconcile budget differences between the two legislative houses. The Senator is cautiously optimistic for a successful outcome.